The very word 'cruiser' evokes memories of famous naval battles and yet very few people could give an accurate description of a cruiser's function as a warship. 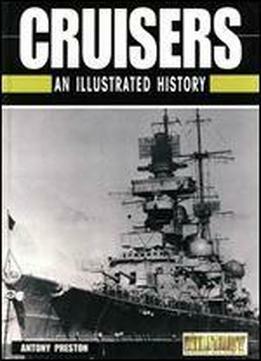 In fact even naval historians have difficulty in defining just what a cruiser docs. The answer would depend on the period chosen, since cruisers have been constantly changing in the last hundred years. In many ways it is easier to say what a cruiser is not, for she is neither battleship nor destroyer, and yet she has often fought decisive actions against both types. The word 'cruizing' was used in the eighteenth and early nineteenth century to describe independent operations by a single ship, unattached to any squadron. 'Cruizcrs' therefore, were usually frig­ates but equally were often smaller sloops and brigs, and very rarely ships-of-the-line. The essential meaning of the word was a description of function, not a classification of a ship-type. These operations could be against privateers, preventing them from preying on mer­chant ships they could be against an enemy's shipping, or they could be merely to provide a distant squadron with intelligence. The term continued to be used when steam was introduced, but in the 1880s it came to be applied increasingly to a broad category of warships, smaller than the battleship and the big steam frigate, and known as steam sloops and corvettes. As their function was to operate in­dependently they were correctly de­scribed as cruisers, but because they were quite sizeable warships, and ranked above the traditional steam sloop in importance, they came to be thought of as a separate category. By 1889 the last of the Royal Navy's big steam frigates, HMS Raleigh, was rerated as a cruiser on the Navy List and a new category of warship was created.